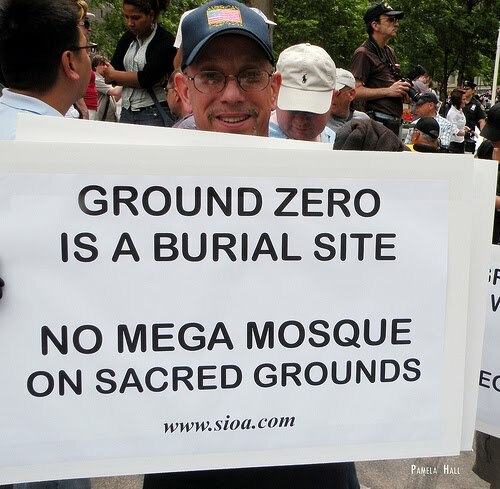 I've changed my mind on the Ground Zero mosque. I opposed it but now I want to see it built. I now see the damage that will be done to America's reputation worldwide if we don't allow it to go ahead. From Pakistan to Persia they are lining up to slam the Great Satan America if we don't give the permission. We should not play into their hands, especially since these countries have only the slightest understanding of democratic rules anyway. Watching BBC World News this morning, the main story was threats by the Pakistani Taliban against foreign aid workers helping the desperate victims of the terrible floods there. These are the kind of dreadful haters we are up against world wide. I think we can show them and the watching world that we value free speech even when it clearly hurts so many vulnerable Americans in the wake of 9/11. I've also come to hate the hypocrisy of some of those who oppose --like the idiot minister in Florida who is ready to burn Korans on 9/11. Or The Murdock-controlled publications, who , while railing against Saudi Arabian money for the Mosque, have neatly hid the facts that one of their main investors is a Saudi Arabian Prince Alwaleed bin Talal. How's that for hypocrisy? Saudi Arabia supplied 15 of the hijackers on 9/11. Let's show the world what America is made of and why what makes us great is we value human rights, free speech and the right to be different. I share no fond thoughts of the religion that will be practiced in the new mosque. The treatment of women,the stoning of adulterers, the blinding of young girls going to school are all part of a lunatic fringe that is tolerated by the mainstream muslims far too much. But maybe the way forward is to show and lead by example like New York mayor Michael Bloomberg is doing. So build the mosque or the community center or whatever it is called.